It’s October and school started a while ago. One of the things people spend a good deal of time on, and sometimes quite a bit of money, is school bags. Backpacks are definitely the most popular choice and luckily there are plenty of designs, sizes, shapes and colors available to choose from. While they are used for school, backpacks are so comfortable and practical, many people use them as their to-go bags for short travels or even daily, to carry their essentials. 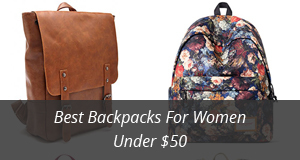 You guessed it, we will be featuring backpacks in today’s review. Eight of them. 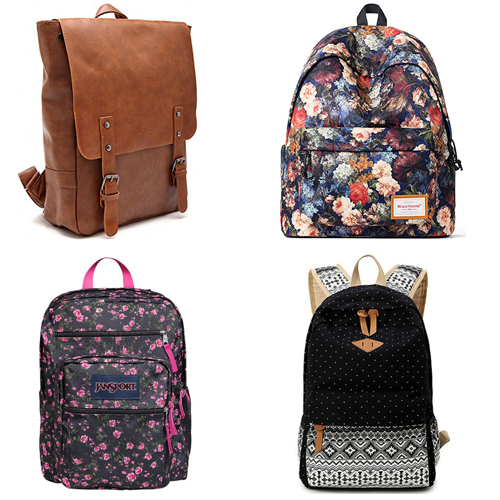 We have selected a variety of backpacks, each with its own design and pattern, and all of them very pretty. And what’s another good thing about them? They are quite affordable! 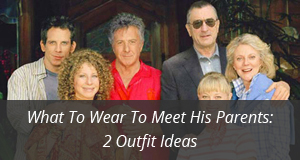 Because we are certain that by now you are curious to take a look at our selection, let’s get started right away. 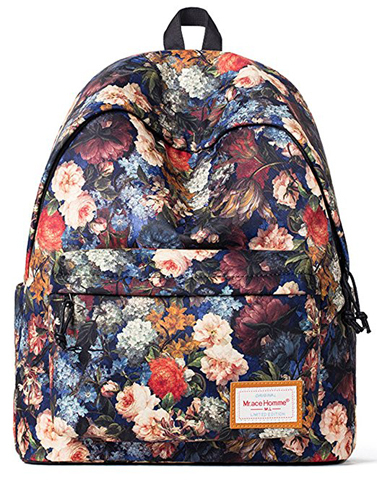 This first one is by Forestfish, a vintage style backpack, with a floral pattern full of colors. 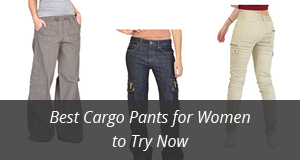 It is made of 90% Nylon and 5% Polyester, highly durable and quite lightweight. There is a front zipper pocket, as well as several pockets on the inside, some of which are slip pockets for phones, pens and pencils, another is a zipper one, and the other is for your laptop or tablet. The size of it is 7.3” (18.5 cm) in height and 12.2” (30 cm) in width. As for color and pattern, there are three different options: cherry blossom pattern, colorful roses pattern and colorful leaves pattern. This next backpack by Toupons comes in a very cool design. It is made of Nylon with the decorations made of genuine leather. Those who live in rainy areas, not to worry, this bag is water – resistant so you will not need a cover for it. It opens on top with a flap and drawstrings, and has two side pockets with zippers. There is another zipper pocket on the back of the bag and also one on the inside, along with two slip pockets. The shoulder straps are adjustable and there is a top handle as well. The measurements are: 10.4” L x 6.3” W x 11.4” H (26.5 x 16 x 29 cm). It is big enough to carry school books, with enough room to spare. There are two colors to choose from: Black and Purple. 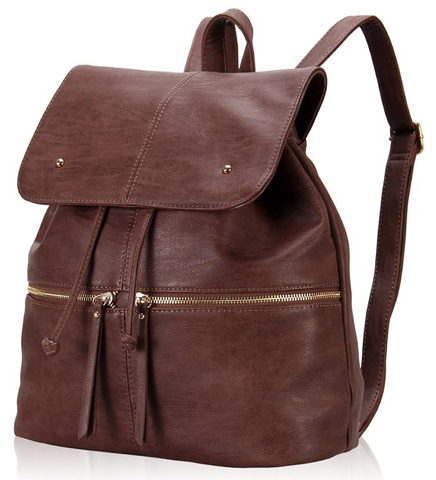 Zebella’s PU Leather vintage backpack is a stylish and nicely sized bag. It is practical enough to carry around, while being quite spacious too. The measurements for this bag are: 16.6” H x 1.7” W x 13.8” L (38 x 12 x 35 cm). It opens on top with a flap and a zipper underneath. The flap has decorative clasps, which have snap buttons underneath to fully secure the flap in place. There are pockets on the inside as well as one on the back. This bag can fit not only books, but also laptops and certainly tablets inside, with plenty of room to spare. There are three colors available: Brown, Dark brown and Black. Another flap backpack, this one is Victory by Hynes Eagle. It comes in a vintage style made of very real looking faux leather. It has two front zipper pockets on the outside and several other pockets on the inside, one a zipper pocket and the other slip pockets. The flap has magnetic snap closure and there are also draw cords around the top, to fully close the bag. It comes in three different colors: Chocolate, Brown and Black, while the inside is cream colored. 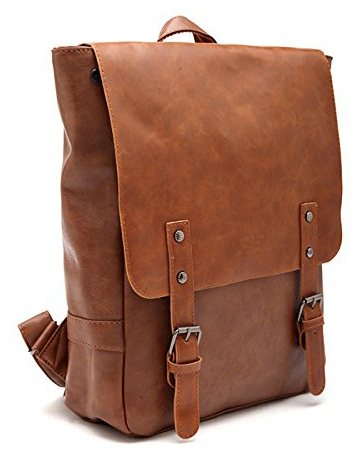 The measurements are: 12.2” x 5.1” x 13.8” (30 x 13 x 35 cm), making it a big enough bag to carry many things, while you are sightseeing around the city or going to school. 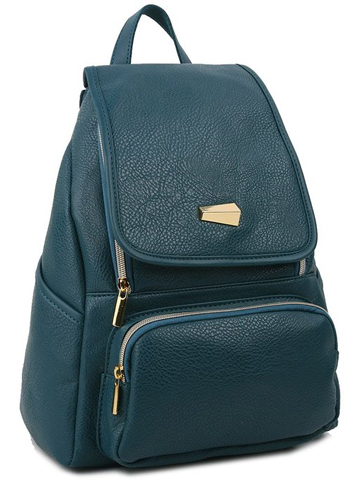 The next backpack in this selection is by Copi, a faux leather bag with a very elegant design. It has a purse – like zipper pocket on the front and there are two others on the sides. On the inside there is only one slip pocket. The measurements are: 14” H x 9.8” L x 5.1” W ( 35 x 25 x 13 cm). It fits a 10” tablet and other smaller books, but keep in mind that it does not fit A4 formats. It comes with adjustable straps as well as a handle on top suitable to carry around. There are several colors available: Blue-green, White, Brown, Black, Orange, Pink etc. 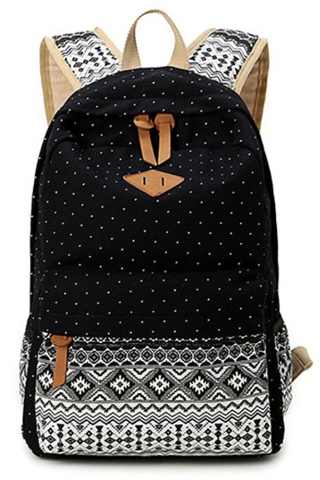 And because we couldn’t leave out geometry patterns, here is a cute bag by Hitop. It comes in many different colors such as : Blue, Black, Navy, Grey, Purple, Light Tan and Rose. There is a zipper pocket on the front and the bag opens on top with a double zipper. It is made of 90% Canvas and 10% PU leather for the details. The measurements are : 12.6”L x 16.9 “ H x 6.7” W (32 x 43 x 17 cm), making it spacious enough for books, notepads and other items of your choice. The shoulder straps are adjustable and padded, for carrying comfort. There also sets available with a smaller bag and a purse included. 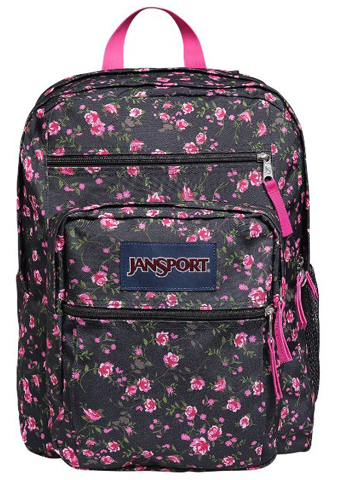 Continuing with another patterned backpack, this one is by JanSport and it comes in a lot of colors, as well as patterns. It is shaped like a rectangle, with a large pocket on the front that has its own smaller pocket, a pocket above those two, and several slip pockets on the inside, as well as one on the side for a water bottle. It is a large bag, perfect for those who prefer travelling light and comfortable. 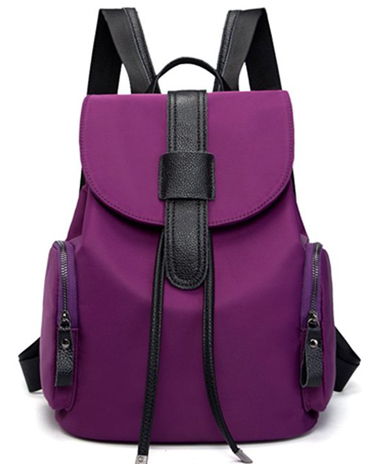 The shoulder straps are adjustable and padded, as is the back of the bag. The patterns are numerous, some including flowers, a zebra pattern, painted stones and many more. 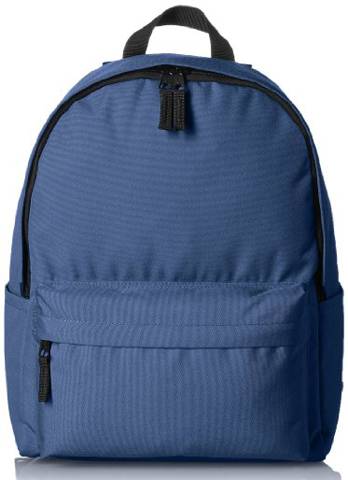 This is the last bag in our selection and if you are a fan of the classic backpack style and would prefer a mono – colored bag, without patterns, this one by AmazonBasics will fit you perfectly. It comes with a front pocket, and opens on top with a zipper. The inside comes with a zipper pocket, apart from the main compartment, and there are also two slip pockets on the sides, for a water bottle or for smaller items. The shoulder straps are padded, as is the back, so you will be as comfortable as possible while carrying this bag, no matter how full it is. The measurements are 13”L x 6” W x 16”H (33 x 15 x 40 cm). There are seven colors available: Navy, Black, Red, Blue, Aqua, Grey and White.